With four distinct sections, the Moon Palace Golf and Spa Resort has something for every vacation budget and style. Golfers will fall in love with the 27-hole Jack Nicklaus signature course. Test your surfing skills or challenge friends with the 'flow rider', an amazing stationary wave generator, that invites guests to drop into their own unbroken waves and test out their surfing skills. Or relax in the world-class spa with an oceanview couple's massage. A myriad of restaurants and snack options keep guests well-fed for the day's activities. Sample dishes from around the world including: steak, Brazilian, Mexican, Italian, and more. Dance the night away in style at the newly designed Noir nightclub, or spend the evening taking in a live show. Kids will love 'the playroom', the newly-arrived kids' club, featuring game rooms, a beauty salon, a theatre, Xbox and toy room, and more, all under profession supervision by hotel staff. Teens will appreciate 'Wired', a space all to themselves where they can listen to a DJ spin the latest tracks, surf the web, grab a bite at the snack bar, and mingle. Located between Punta Cancun’s lively entertainment district and a stunning expanse of powdery beachfront is Krystal Cancun. At this resort every day offers multiple opportunities for relaxation or adventure, whether that means lounging beachside in the panoramic pool or exploring the town. With gastronomy from the renowned El Montero Mexican restaurant on site, there’s no need for foodies to leave the resort, but those who wish to can opt into the Krystal Dine Out Program featuring dining at local restaurants. Use of the modern gym facilities is included for all guests or enjoy the waves with complimentary water sports at the resort’s marina. Stylish and contemporary, this resort offers the best of both worlds – the chance to experience the cultural heart of Punta Cancun, alongside the natural bliss of a beachside haven. Recently renovated with modern amenities, the Riu Cancun offers impeccable getaways along a white sandy beach in the beautiful Corazon resort area. Take in picturesque tropical views while swimming in the infinity pool or recline on a poolside sun lounger under the comfort of a parasol with your favourite beverage in-hand. Active guests can participate in a variety of complimentary water sports like catamaran sailing, canoeing and snorkelling while daily programming, live music and shows keep visitors entertained. With Italian, Asian, gourmet and steakhouse classics expertly prepared at the resort's restaurants, including the poolside Turquesa and Coral eateries, guests have varied options for dining. For the ultimate in luxury, travellers can add-on a pampering treatment from the Renova Spa to recharge and rejuvenate. 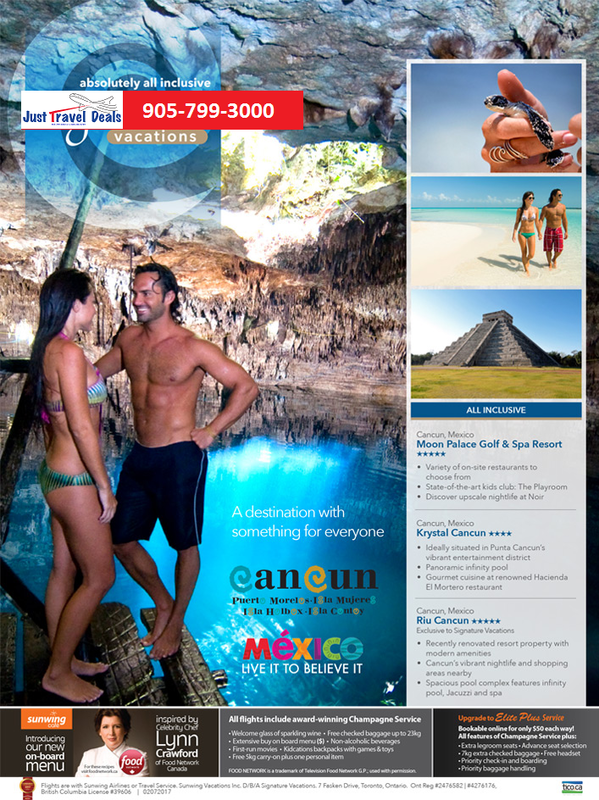 Groups Receive Complimentary Rooms, Upgrades & More in Cancun, Mexico! A family Cancun Mexico vacation! Great Getaways | Make Family Memories on Mexico's Pacific Coast! Great Getaways | Last Chance! Kids Stay Free at Select AMResorts.